Happy Holidays from Netburg Services! Norwood (Ohio) Christmas Town went well this year. Netburg Services sponsored the horse-drawn trolley shown here which was an addition to the four horse-drawn carriages featured last year. Rides were free. Also, the Norwood Police Department had a Shop With a Cop event recently. Funding was provided by the Greater Cincinnati Police Association. Netburg provides partial funding to this program through the Greater Cincinnati Police Association. I don't feel comfortable including a picture, but here is a link to pictures provided by the Norwood Police Department. It's been a hectic year at Netburg and it isn't over yet. We're hoping your year went well and that 2016 will be better. 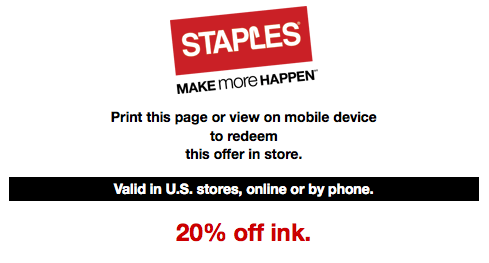 Now read what it says: "Excludes all toner, Epson® ink and toner, HP ink and toner..." What the heck, Staples? The last printer I bought from you was an HP printer and now you going to require that I pay full price for ink for it? When HP will sell it to me for a discount? Why do I even do business with you when you do a "bait and switch" on me like this and waste my time? The next time I need office supplies, I'll check around and try to find someone with everyday low prices, not a company that keeps sending coupons that don't apply to me anyway. Update June 29, 2016: "Your message couldn't be delivered to the recipient because you don't have permission to send to it." is a Microsoft Outlook euphemism for "The recipient is no longer with the company." Ever since I graduated from college in 1976, I have heard about a shortage of computer professionals. There is no shortage today, and there never has been. I can't tell you how many computer professionals whom I know who have left the field due to either a lack of work or low pay. Here are my answers. The answer to Question 2 is "Networking, primarily using LinkedIn. Duh!" I do have a relationship with Cincinnati State but it's inactive at the moment. The Norwood (Ohio) Fireworks Committee sent out this image to thank the sponsors this year. If you and your family were able to attend, we hope you had a great time. See you next year! ● Greater Cincinnati Police Athletic Association — We sponsor "Shop with a Police Officer," food baskets, sports sponsorships and other activities. Updated November 28, 2015 to update Norwood Christmas Town sponsorship. In May, a representative of American Express cold called me about a new Enhanced Business Gold Rewards Card for my business. I have an American Express business card already which is also my Costco membership card. But Costco is going to end that card in March 2016. I thought a new American Express card for my business would be good to smooth the transition. When you sign up for a new business card, they can set you up with a bonus program. When I talked to Frederick (not his real name) on July 8, his offer was 25,000 Membership Rewards® Points if I charged $5,000 to the card in three months (91 days). However, my wife had received an offer in the mail from American Express for the same card that offered 50,000 Membership Rewards Points for $5,000 in three months. Of course, I preferred that offer. However, Frederick's supervisor, Jonathan (again, not his real name), was going to make me a great deal: 75,000 Membership Rewards Points if I charged $10,000 in four months (122 days). What's there not to like? Only one thing: $5,000 in charges in three months is something I can do; $10,000 in four months is unattainable to my business and me. So Jonathan, in his "generosity," set me up to fail and the bottom line is that I will have zero Membership Rewards Points in four months. Frederick wasn't authorized to change the offer and Jonathan hasn't gotten it done, even though it's been almost a month. Calling American Express customer support was no help; the first call couldn't fix it but gave me a number for New Accounts. I called New Accounts twice. The first time, they said that they had no record of a new card for me. The second time, they said that they were a fraud department and that I had the wrong number. I asked them to give me the correct number for New Accounts and that number couldn't help either (although the representative nicely explained the terms of the bonus program). Note that, after you get your new card and you set up your account on their web site, there is no mention of the bonus program. You can't see what program you're in or how many charges you've accumulated towards the goal. The only way to get that information is to call them. Normally I wouldn't post this (it's my word against theirs) except that American Express has recorded every phone call I made to them. They can go back and verify that, yes, Frederick said that Jonathan would reset the offer. I'm putting this down as bait-and-switch: They dangled one offer in front of me, switched it to a "better" offer that is unattainable then refused to switch it back. As of today, I am stopping using my new American Express card and will cancel it after I pay the next monthly statement. Stay tuned, because I just may get a call from someone at American Express about this; I will update this post if Amex fixes this situation. Update August 23: I have just paid the bill for the second month of charges. I feel like I'm dealing with a company stuck in the 1980s. I signed up for 3X points for gasoline charges but there is no indication that they are going to pay me the 3X. Each month, I accrue Membership Rewards Points for charges but they are not actually added to my account until the end of the next billing period. They say that I have to pay the bill to get my points, but the computer doesn't give me the points even after they've posted my payment. It's not until the next statement that I get my points and then the 3X for gasoline are not there. This has just been a bad experience all around. I wanted to short their stock when it jumped to $81.34 per share on August 11 but I didn't get it done. It's now down 5.3% and going down further, I expect. Update November 11, 2016: When I canceled the account the representative told me I could contribute the 4,000 bonus points to a charity from a list. He said to watch for two email messages. The messages never arrived. It was a fitting end to a relationship with a sleazy company stuck in the '80s. Today, the stock is down 14% from August 11, 2015 but it has been lower. The Norwood (Ohio) Hometown Fireworks was a success once again. Attendance was estimated at 2,500 to 3,000 people. I was delighted to see the large number of small children attending. 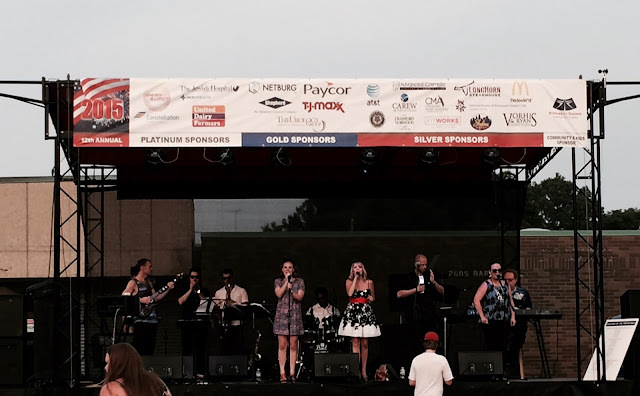 Here is a picture of the Powerhouse Boogie Band with the sponsor banner. Netburg is proud to have been a Gold Sponsor this year. 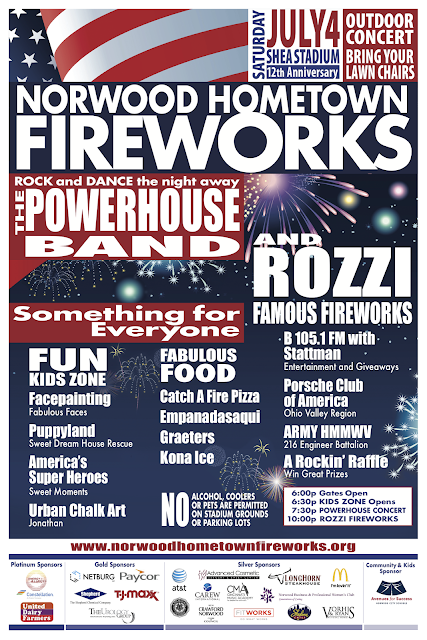 You're invited to attend the Norwood (Ohio) Hometown Fireworks on Saturday, July 4. Admission is free. 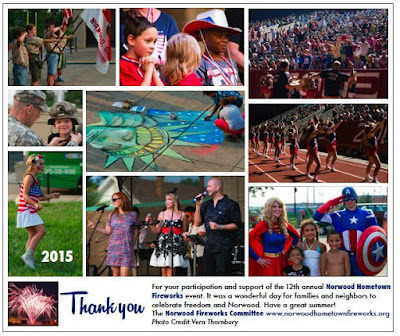 Activities begin at 6 p.m. EDT at Shea Stadium, 2605 Harris Ave., Norwood, OH 45212. Parking at the stadium is limited but there will be extensive parking available nearby. If you have a handicapped placard for your vehicle, please go to the stadium for directions to handicapped parking. Netburg is one of the Gold Sponsors of this event. We hope that everyone has a good time! Click here for the full poster (12" x 18", 4 Mbytes, view only). Updated July 10 with minor changes. Specialization: IBM Power Systems (IBM i, iSeries®, System i®, AS/400®) servers. I prefer working with real-time (batch is obsolete) systems designed to run continuously 24/7. I also specialize in integrating the IBM i to everything on the plant floor but I’m flexible enough for other tasks as well. Currently, I’m looking for an opportunity involving an equity investment in a business, in contrast to being an employee or a consultant. Although my experience is in writing real-time programs, my forte is gathering complex information and determining the underlying principles and trends. Please don’t send me unsolicited ideas as I already have a list of 50+ ideas and I wouldn’t want you to think I stole yours. But if you think I could help you with your business, contact me through LinkedIn, at bruce.hobbs@gmail.com or at bruce@netburg.com. To be honest, I am growing disillusioned with the IBM Power Systems platform. It’s like a Swiss Army knife, which is both an asset and a liability. The one thing IBM needs to add is the ability to run Windows Server 2012 R2 either natively or through emulation in its own partition. IBM sold its x86 server line to Lenovo and now manufactures nothing that can run Windows Server. IBM, Power Systems, iSeries, System i and AS/400 are trademarks of International Business Machines Corporation in the United States, other countries, or both. Netburg is a service mark of Stevens Communications Inc. Netburg is not affiliated with IBM. I prefer working with real-time (batch is obsolete) systems designed to run continuously 24/7. I also specialize in integrating the IBM i to everything on the plant floor. But I do other tasks as needed; I work on everything from hardware to Java. I'm one of the few people who has repaired an IBM disk drive to avoid a full system restore. If you're looking for someone to improve an accounts receivable report, I can do it but I won't get excited about it. But if you want to be the first plant engineer to install a new type of machine in a group of over 200 manufacturing plants and you need help getting the IBM i to dance, then I could be your person. I don't do 40 hours a week well, but I will be there when the job needs to get done. Availability for new clients: April 2015. I recently worked on interfacing the IBM i to two systems, one of which uses SQL Server for its database and one that has an OData connector (here's a shout out to Scott Klement whose information was helpful with both of these interfaces). Both interfaces are running smoothly. Many years ago, I designed a system to interface an SAP ERP system to bar code readers and process control equipment. This system allows real-time updating of SAP data from these sources outside SAP so that the ERP view is always up to date with the actions on the plant floor. Soon, I will be adding caching so that this system can run independently of SAP for several days with full editing. I have modified packaged software to allow commission statements to be e-mailed directly to sales agencies with a PDF check image attachment. The payment is made by an ACH transfer.